The Archaeological Site of Nalanda Mahavihara at Nalanda, Bihar comprises the ruins of a Buddhist monastic and educational center. The main stupa was built by Emperor Ashoka in the 3rd century BC and contains the relics of Sariputta, one of two chief male disciples of Gautama Buddha. The remains consist of an earlier cluster of stupa-centered buildings and a later linear system on a north-south axis. Apart from religious buildings, the site contained 11 ‘viharas’ (used for study and housing). Nalanda was one of the most important places of learning in its day and is often characterised among India's early universities. It attracted scholars and students from near and far with some travelling all the way from Tibet, China, Korea, and Central Asia. The site was abandoned in the 13th century. Most about this place has already been said in a greatly written review so I shall now only add that it has since been inscribed and got a nice price hike. Twice! I arrived here by car from Patse and there were so many locals around, school groups, monks, selfie-posting teenagers, selfie-posting monks, a whole food market along University Road, I didn't expect to get through it all. However, there are actually parking spaces just past the entrance gate. So you pay that hefty entrance tickets for a bunch of walls. Mostly. There is one impressive building still standing tall but there is no way you would know this place was a big ancient university with monasteries and temples unless you read all signs. It's brick walls now. The area is not big. I figured this is all I can see and went through the loop within 30 minutes. Next up the museum and off we go again. Very disappointed. Makes me wonder what people expect to see here. Agree that the history behind it is important though, not agreeing that I should seek out the place to see it. The road from Patna is also very annoying and perhaps next time I would stay on the toll road longer. Nalanda epitomizes both what India has to offer in uninscribed sites and also its perennial inability to bring these forward to successful conclusion!! The Web is full of calls for it to be inscribed (often uninformed in suggesting that fault lies with UNESCO rather than with the governments of India and Bihar!). The most recent (early 2013) have been from the Nobel Laureates for Economics Amartya Sen and Joseph Stiglitz. So what is so special? Well the ruins at Nalanda are of what is claimed to be the world’s first international residential university, with students coming from as far away as Tibet, China Greece, Persia, Korea, Japan and Java. It is claimed that, in its time, it was the most prestigious seat of learning in Asia. The Tang dynasty pilgrim Xuanzang left detailed descriptions of its size and magnificence. It operated between the 5th and 12th Centuries when it was sacked by Muslim invaders who burnt its libraries and destroyed its buildings. It accommodated over 10000 students and 2000 teachers across an enormous site. During excavations between 1915–37 and 1974–82 11 monasteries and 6 temples were uncovered across a sq km – but over 90% of the site is still thought to be unexcavated. The structures are all in brick and reminded me of the Vihara in Pahapur Bangladesh (see my review) which is on a far smaller scale. The monasteries are all virtually identical in layout and consist of quadrangles of cells around a central courtyard, together with communal buildings such as Kitchens and the 11 excavated to date are laid out in a line – variations concern matters such as how many students occupied a cell and a differences can be discerned between those for just one and those for 2 or 3 as ideas changed and sects developed different approaches to teaching. The central kitchen to which monks came to collect their daily ration reminded me very much of the monastery we had seen a few months ago at Amarapura in Myanmar. Across an open area from the line of monasteries are situated the temples. These consist of a high central brick mound with a large chamber which presumably contained a Buddha statue, and surrounding stupas. The mounds have surviving decorations in the form of Hindu and Buddhist images, both sculpted and stucco. A visit to Nalanda should only take 2 hours (it is worth taking in the museum across the road from the main site). The drive from Bodh Gaya is around 2hrs (only 75 kms, but extended considerably in time by the need to pass through Gaya.) – so you could do it as a day return trip and take in Rajgir as well with its Buddhist and Jain sites. 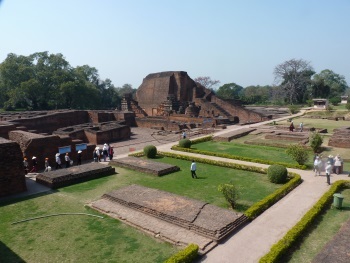 India is rightly proud of its early historic role in developing Asian culture and aspires today to a similar role – hence a modern university has been set up in Nalanda and those countries whose contemporary culture owes something to the ideas sent forth from Nalanda are involved in building the new university’s capabilities – it is well worth reading the University’s “Vision” here http://nalandauniv.edu.in/abt-vision.html . So, you will gather that I am generally well disposed to the possible future inscription of Nalanda! The ruins are impressive and, to my knowledge, “unique” – at least in their size/extent. They also represent a noble aspect of human history which, I would have thought, would resonate well with UNESCO – as would the implied support for the new university which inscription of the old would give. Generally, a proposal worth supporting! Whether India can “cut the mustard” as regards preparation of a proposal, developing and implementing management plans etc is another matter (Although, initially, the site seemed to be well cared for among pleasant gardens, closer inspection identified areas of crumbling brick and stucco work in the further temples). Bihar (together with nearby states) is majoring on its Buddhist credentials as far as tourism is concerned (no doubt with an eye on what should be a very lucrative tourist market from the Far East) so it has plenty of incentive. There is already a “Buddha Trail” as there are numerous places associated with Buddha himself around Bodh Gaya/Nalanda/Rajgir. Although the heyday of Nalanda dates primarily from 5th C AD it is interesting to read this comment in the T List documentation “Nalanda has a very ancient history and goes back to the days of Mahavira and Buddha in sixth and fifth centuries B.C. Many references in the Pâli Buddhist literature mention about Nâlandâ. It is said that in course of his journeys Buddha often halted at this place. It is also the place of birth and nirvana of Sariputra, one of the famous disciples of Buddha.” How justifiable this is and how much evidence remains in situ I know not! But it probably isn’t that important. Apart from “management issues” what could go against it? Well the title provides one possibility – it is called “The Excavated remains at Nalanda” – so, a very large area of potentially historically significant unexcavated remains would remain outside. No doubt these remains lie under nearby villages, towns, factories etc etc and, if ICOMOS insisted on their protection, all sorts of problems would arise! The issue of comparability with existing or other potential Buddhist “educational” sites could be another issue. Taxila is already inscribed, but its educational credentials which started in 5th C BC were coming to an end as Nalanda came to prominence. There were 5 or 6 Buddhist universities in N India which were generally contemporaneous with Nalanda, ie, from the Pala era. The remains of Vikramsila are some 300kms east of Nalanda whilst Jaggadala lies not far from Pahapur across the border in Bangladesh. It is on the Bangledesh T List but I have no information on any preparation being made for inscription – Bangladesh is having enough problems maintaining the monastery at Pahapur properly! Both have visible remains but none, from what I can find out, is as extensive as Nalanda. I suppose that ICOMOS could queer the pitch by citing them but it would seem better to take the offered site if India nominates it and get it under UNESCO protection ASAP! 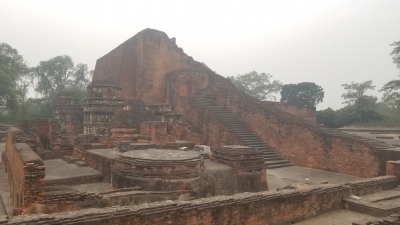 From "Archaeological Site of Nalanda Mahavihara (Nalanda University) at Nalanda, Bihar" to "Archaeological Site of Nalanda Mahavihara at Nalanda, Bihar"